Every month or two we will be putting a Newsletter onto our website to update all our friends and guests around the globe. Sorry for the delay in writing this newsletter for you, but it’s been a very busy 2 months here on the fishery! Read on and you will find out what I have been up to! Winner of our 7 night competition was John Clarke (photo above) from Poole in Dorset! Thank you very much for speaking to me today and giving me the great news about winning the competition for a stay with you at the fishery, we are extremely pleased to win this lovely prize and look forward to meeting you and staying at the fishery. We stopped in at the fishery on October the 4th 2012 and walked around the lakes which looked wonderful. My partner Lesley who comes sea fishing with me has always wanted to learn to fly fish; she has been with me before but never tried, so the fishery looked just the sort of place that would help her learn to do this. We met one of your staff who was very nice and explained all that was going on in the fishery and also introduced us to your rare breed pigs, which is Lesley’s favourite farm animal. I have since bought a full fly fishing kit for Lesley so she is keen to try it out. 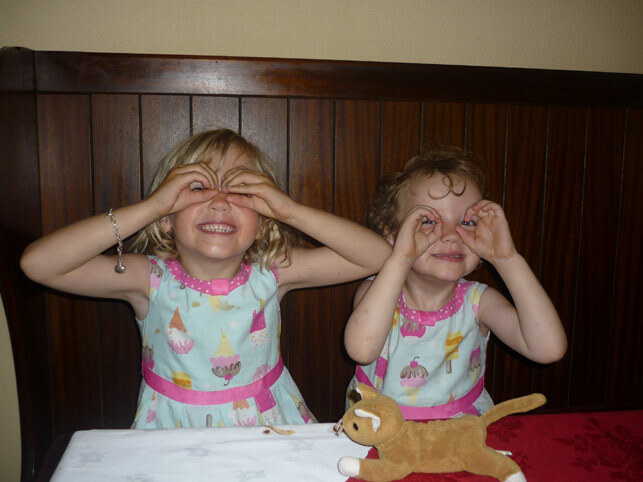 I would like to congratulate the competition winners for June, who both receive a bag of goodies! Firstly was Nik Wallis from Plymouth with a lovely rainbow of 13lbs-10z from our Osprey Lakes, he caught this fish with a hot head damsel. Well done Nik! 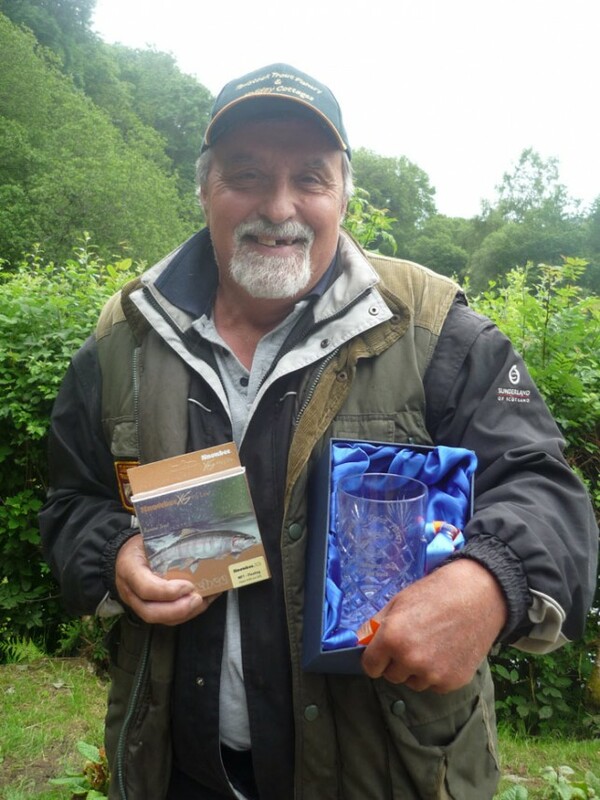 The winner of our heaviest three fish from our Kingfisher and Heron Lakes was a close match with Roger Stephens from Exeter with a bag of 17lbs-9oz! Well done Roger! Please can both gentlemen collect their goodie bags when they are next at the fishery! 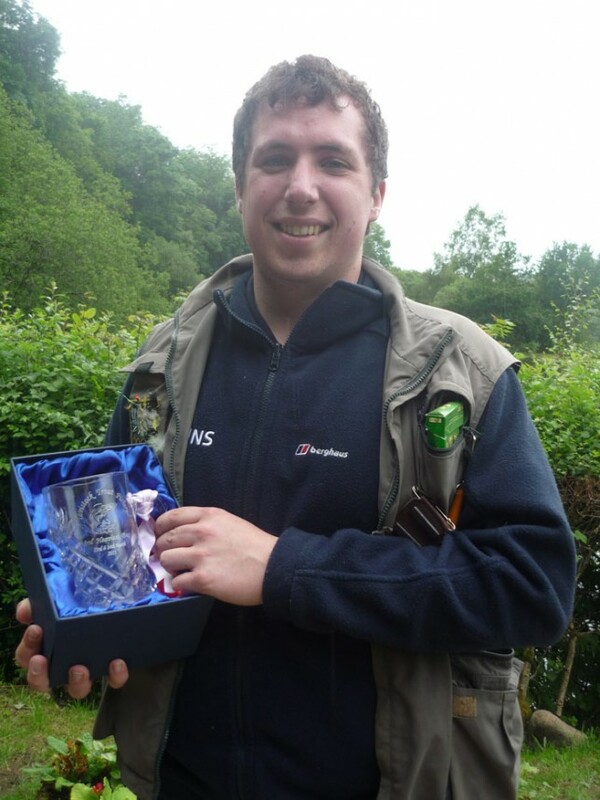 Peter Styling and Josh Harrington collected their engraved tankards on the 22nd June that they won on opening weekend! The early bird catches the worm was correct this weekend for you two! Well done, I was delighted to present the tankards to two great gentlemen! A special angler who I have known for years and years! Laid back, chilled and happy! I had a lovely English couple visiting from Mexico and they told me that they prefer living in Mexico because people are so friendly and life is a little different to England. Well I haven’t actually been to Mexico, so I can’t comment on that part of the statement but I can say that here at my home I myself am laid back, chilled, very happy and friendly and nearly all of my guests leave just the same, well apart from the 2% of anglers that didn’t quite catch enough fish, or the 20% who caught too many fish! I am sure that with the addition of my next piece of news, more holiday makers will be happier than ever and even more chilled! The hot weather recently has been every trout farmer’s worst nightmare and with the larger fish hating every minute of it, I can truly say that my trout and I prefer winter! Nearly all trout farmers across the country would have suffered more fish mortalities in these hotter conditions and although I have lovely fresh running water from the river Tavy, even I had a tough time. So support your local fly fishery and enjoy your trout fishing! Tell the owner that you realise that times have been hard for him/her but you will continue fishing! I am hoping Jon Hughes, Maria and Andrew Seabright along with many others will join me on the opening weekend for Champagne and canapés! Opening date will be my daughter Amelia’s birthday Saturday 5th April 2014, so pencil this date in your diary and I look forward to seeing you all! 1st June – Concrete bases for our new chicken sheds were completed and then the sheds were erected! Mr and Mrs Christmas love their new home! 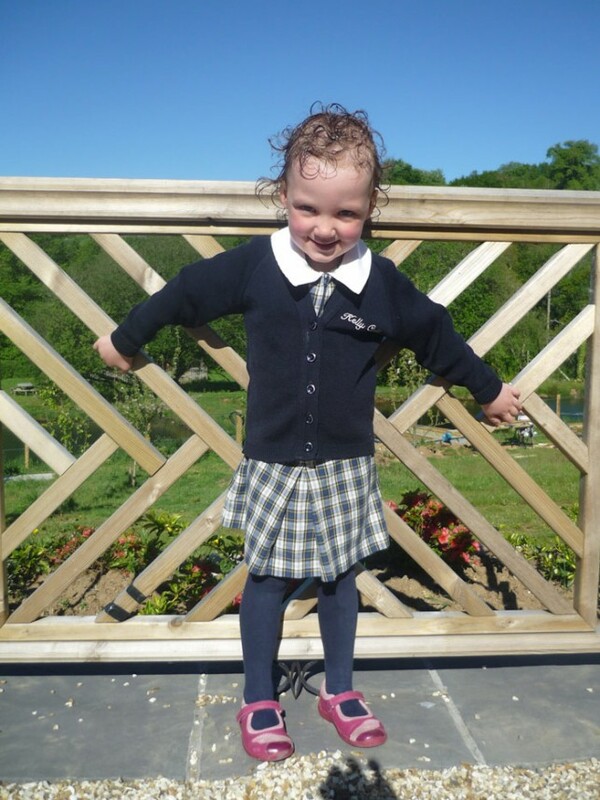 4th June – A very excited Amelia started her first day at Kelly Prep! A delightful school only over the road from me! A real advantage because I’m self-employed…I leave work at 4.15pm and I arrive at school at 4.15pm! 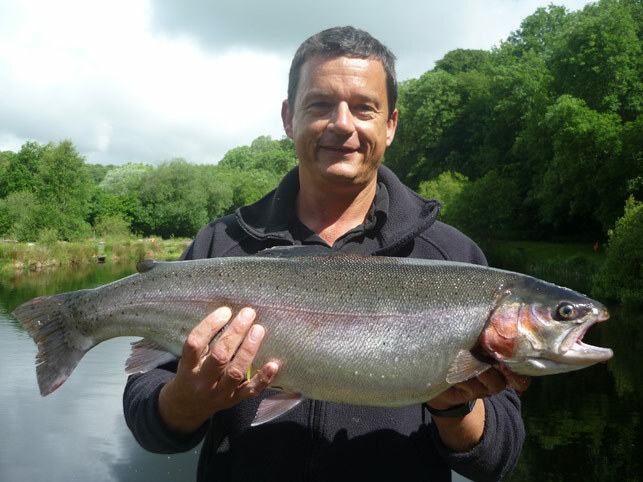 14th June – Lovely 12lb-4oz rainbow caught by Mr Poyntz from Plymouth with a damsel. 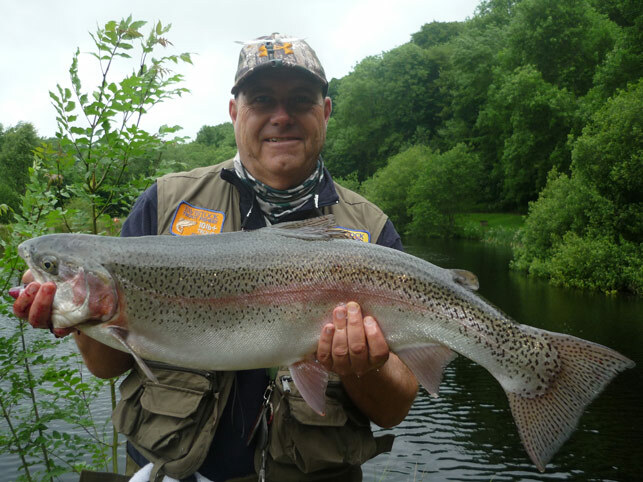 23rd June – Was a lovely day with Gary Champion demonstrating how to cast a fly on our lakes and while he was casting he also managed to catch a fish or two! Gary’s casting was amazing and we were very lucky that he came and honoured us with his company. Well done Gary and thanks so much for visiting us! An unexpected visitor on this day was my Uncle John and Auntie Anne and what a fantastic and lovely surprise this was for me! Uncle John is my late father’s brother and it was truly a real treat to have them on such a special day and we toasted the occasion with a few bottles of Moet!! Although I know my father was a very quiet man and believed in not saying too much and taking everything in, I know one thing is for sure and that is that he loved his brother dearly! So Uncle John visit me again soon, as you made my summer, maybe next time, you will stop for a day or two, well I hope so! Plenty of stunning rooms to stay in here and by next April, even the pub that your brother loved so much, fully restored and run by his daughter! 24th June – Always a very special day when I have my nails painted and a facial with Tabetha from Pink Beauty, our on site beautician. I can truly recommend that all my guests should try a treatment or two with Tabetha as both the log cabin and the facials are so relaxing! To book ring 07837 125680. 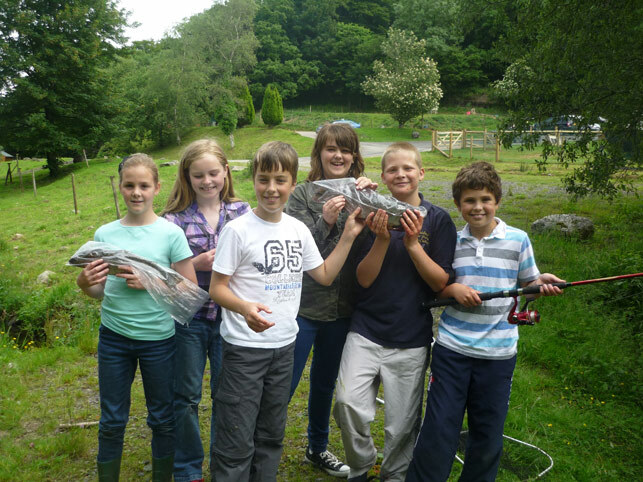 29th June – Jack had his 11th Birthday Party with his school friends on our float fishing lake and trout were caught by all! It was truly a special day with lots of fun had by boy and girls! The only sad part to the day was that Jack fell over and cut his leg but he had a shower and put on a brave face and enjoyed the rest of the day! Thanks to all of his school friends for coming and for the lovely gifts! 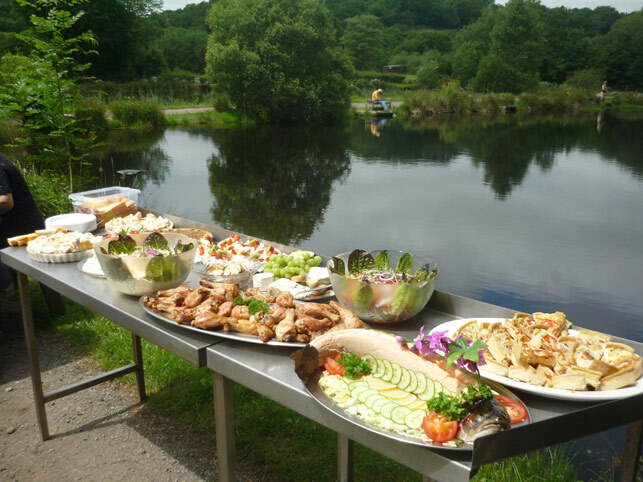 30th June – My thank you party day for helpers of the fishery and what fun it was! Everyone had a great day and even the sun came out as the bottles of Champagne were drunk! I made heaps of profiteroles and homemade chocolate sauce and homemade pavolovas with my lovely pastry cream! Yummy! The only thing was that I was just too slow to actually make it in time to have a piece of pavolova! Oh well, I will be making them regularly from April in my pub, so I’ll have a piece then! Mr Poyntz’s fish which was donated to my event was kindly cooked and decorated by my friend Will Stephens, thanks very much Will! 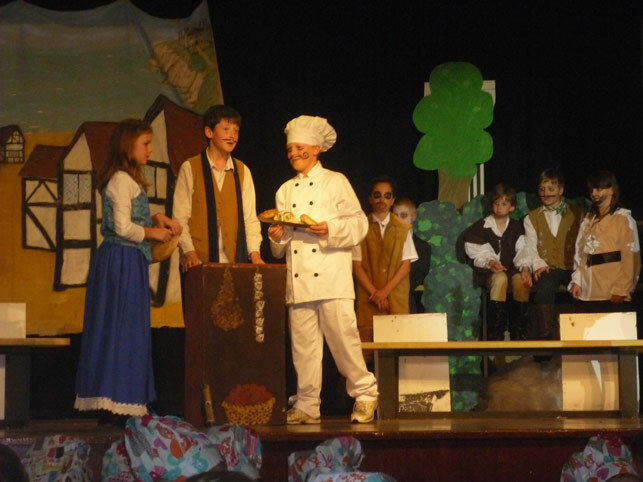 3rd July – Jack’s school play at Kelly Prep was again great fun! Jack played a baker and although he only had a few lines, he was excellent! He is looking forward to the challenges that joining Kelly College in September will bring and I will be right behind him every step of the way! Good luck Jack and although I would like you to learn at school, have lots of fun too! 4th July – Strangely I was asked by Jack’s swimming teacher if she could borrow one of our lakes for a swim with her friends! Lindsay wanted to practise swimming in cold conditions for her Triathlon the following weekend. Personally, I would rather have watched tv than get into the cold water but Lindsay was keen and happy! Lyndsay has successfully qualified for the Iron Man in Germany next year where she will have a cut off time of 15 hours to complete the course! Well done Lyndsay! 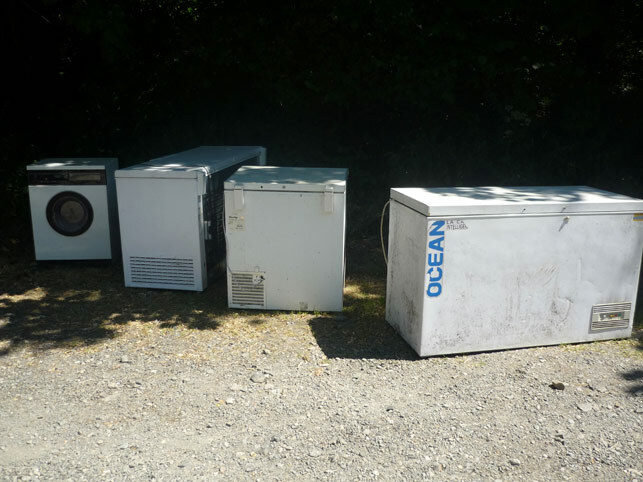 10th July – Always before I leave for a night in the caravan I check my water levels and this day was no different. I drove up to the top of my farm and noticed that a piece of wood had got stuck on the end of one of my deep 6” pipes. I decided that I just could not be bothered to go back and put my waders on as Mark and our children were already in the car waiting for me. So I decided to strip down to nothing by removing my summer dress and my underwear and go in the water and remove the piece of wood! Much to my shock the water was very cold and under my feet was soft and muddy but I’m a trout farmer and at the end of the day, it’s my job! After retrieving the piece of wood I stepped out shook myself off and found a towel on the mule to dry myself enough to put my dress etc back on. After I got back to our car and told Mark what I had to do, he was disappointed that he missed it! I on the other hand was relieved that I had no audience! 18th July – This was the day I actually had to ring the police and tell them that I was going to break into my own pub! A very wise move I think because being arrested for breaking into a pub is not on my list of ambitions! Yes, it was lovely to be allowed back in a pub that I leased 15 years ago. Although I have obviously been in the pub during this time eating and drinking, I have not felt particularly welcome. I think my presence in the pub as the owner of the building used to unsettle my tenants a little and I always felt that was very sad. 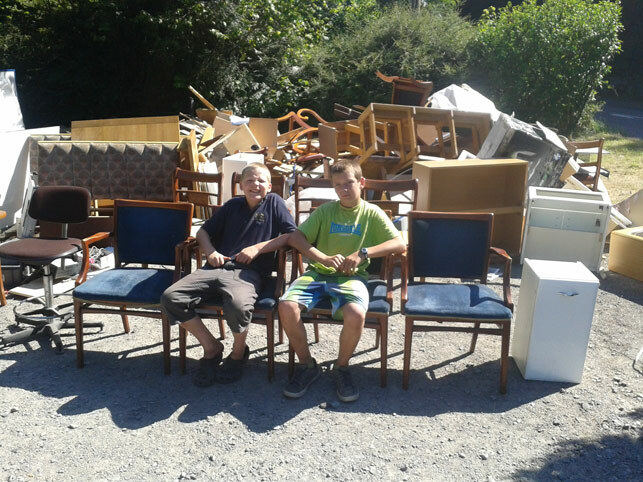 22nd July – This was quite an exciting day with the first potential new tenants viewing the pub for the first time. I showed them around and all seemed quite good and they said they would ring me the following day. I was quietly confident that they would want to do a deal with me for the pub as they had been asking to view it for over a year by now. 23rd July – Well never take anything for granted I say, I received the phone call in the afternoon to say that they didn’t want my pub! You could have knocked me over with a feather! I was truly in shock, what was I going to do with my pub now? I decided the best short term solution I could think of was to steady my nerves with a brandy at tea time! Not my normal way of dealing with a problem but a large empty pub isn’t a normal problem and so on this day; it seemed an appropriate, temporary good idea! However not a good idea really, I ended up having a minor tiff with Mark and decided at 10 pm that I wanted to be near to my pub so that I could think about what to do with it. I wrapped myself up in my blue bathrobe and put on my pink crocs and armed with my large black heavy torch I set off to sit next to my late father’s bridge and look at my pub. It was lovely to sit looking at the pub my father adored and to ponder over the many memories I have of him and I together in it. One of my memories was when he used to lean over the bar and help himself to the red wine on tap….he loved our pub, just as much as I do! Anyway back to the story, it wasn’t long before a car pulled up and a man got out and walked up to my pub door. I thought he was going to break in or tear down my sign and protective hormone kicked in and I shone my large bright beam onto him and asked him what he was doing. Not a really sensible thing to do at all! He must have thought I was a complete nutter really, standing there in pink crocs and wearing a bathrobe and asking him what he was doing! Anyway he told me that he used to drink in the pub and he wanted to know what was happening to it. I told him that I owned the pub and that I had not decided what to do with it yet and after chatting to him for a while, much to Mark’s relief I returned home! 30th July – First meeting with Richard Baker (building inspector) and Graeme Barclay (architect) at the pub to discuss what I wanted to do and all went really well! Lots of work I know but the end result will be stunning! 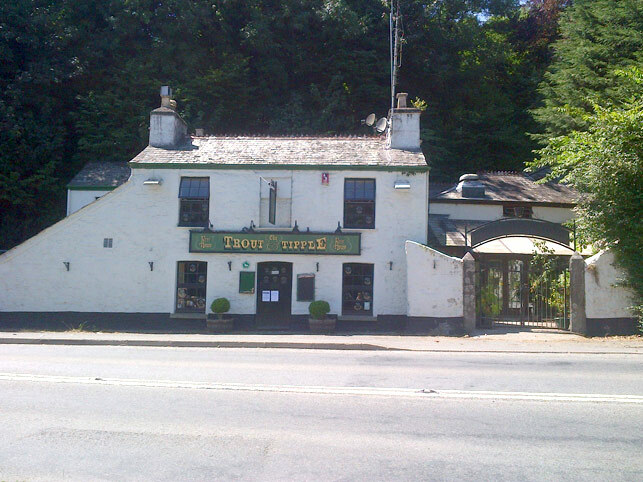 A lovely traditional pub with modern facilities and stunning letting accommodation! Pubs are having a very difficult time at the moment and so it’s a brave move on my part but one that I know my father would have loved to have seen! These next few months are truly my favourite with daddies and dries being the firm favourites! So dust off your tackle and join me for a day on my delightful fishery! Free tea and coffee and yummy biscuits for all anglers fishing on the day, it’s a top fishery which is well worth a visit! My last sentence must of course go to my late father who died on Sunday 17th August 1997. 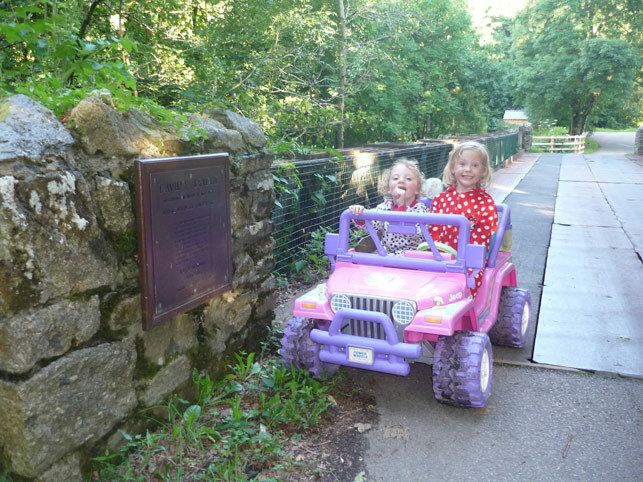 My daughters are pictured above visiting the plaque today that I had put up after he died. I have never been invited to visit the place where his ashes rest…. maybe one day I will be allowed but for now we visit our plaque on his bridge here on the fishery which I named after him. I look forward to renovating my pub in his memory and to toasting my father with a brandy or two when it’s complete, of course I will be a Licensee then, and so I wont be allowed to drink too many! I held my father’s last two birthday parties in this pub and the last time I spoke to him, I was stood in the bar area. He always knew that I loved a challenge and the renovation of this pub will certainly be that! It will be decorated to a very high standard and no expense will be spared! I will be gutting it from top to toe and I will post photos of the update on my facebook page and in my newsletters…maybe even a photo of me in my blue soft bathrobe, probably not, but you never know! Join me next year for a drink in my delightful pub, with a lovely happy laid back atmosphere, nice music and gorgeous food! No need to bother with a babysitter, mastermind, chess and colouring pens and paper on a shelf in the corner for the little ones in your life while you chill out and relax, after all that is what a pub has always been about! It will be a proper pub with a great philosophy, ‘to have fun’! The fishery will be open on the bank holiday Monday in August.